Defence Minister Christopher Pyne has announced two landmark Future Submarine program updates as the project starts to take shape in South Australia. Hundreds of new construction jobs will be created following today’s historic sod turning event at the site of the Future Submarine Construction Yard at Osborne in South Australia. Minister Pyne and Minister for Finance and the Public Service Mathias Cormann said the sod turning marks the formal beginning of works at the yard. 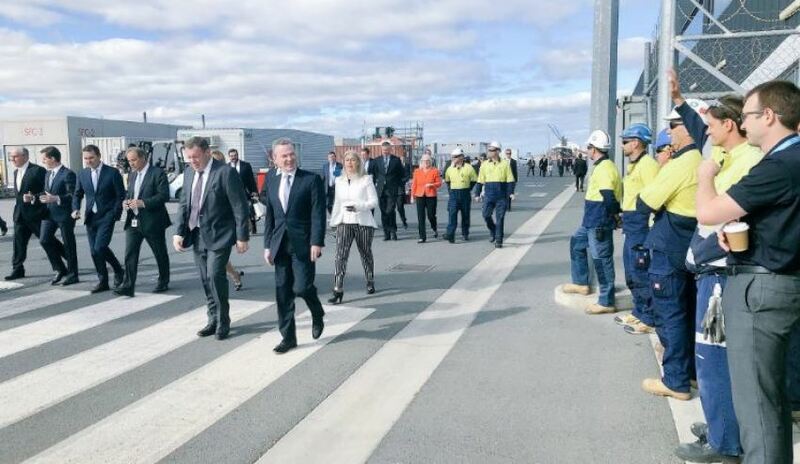 "An Australian continuous naval shipbuilding capability will see the creation of thousands of jobs across Australia over coming years, hundreds of which are construction and infrastructure roles based at the Osborne Naval Shipyard," said Minister Pyne. "Overseen by managing contractor Laing O’Rourke Australia Construction, these jobs will see the construction, refurbishment and modernisation of purpose-built facilities specifically designed to enable the most effective build of Australia’s Future Submarine fleet," he added. This selection underscores the government’s commitment to the fundamental role local industry is playing in every aspect of the continuous naval shipbuilding plan. Minister Cormann said the government’s decisions to establish Australian Naval Infrastructure (ANI) and purchase land and facilities from the SA government in 2017 have enabled work to progress rapidly. "The investment we have made through ANI will support a sustainable, long-term naval construction industry in Australia," Minister Cormann said. Both ministers said this achievement once again highlights the government’s $90 billion commitment to upgrading the Navy’s fleet in the years ahead. Minister Pyne also confirmed that key negotiations between the Commonwealth and Naval Group as part of the strategic partnering agreement (SPA) had been successfully completed. "I can also announce the negotiations between the Commonwealth and Naval Group on all key provisions of the SPA have been completed. I congratulate to everyone involved in achieving this significant milestone," Minister Pyne said. Minister Pyne said the SPA would be formally signed in early 2019 and will govern the delivery of the Future Submarines over the decades to come. "Work on the design of the Future Submarines will continue without interruption under the design and mobilisation contract, which was signed on 30 September 2016," Minister Pyne added. The new vessels will officially be known as the Attack Class and will be delivered as part of the $50 billion SEA 1000 program, which will see Naval Group deliver 12 regionally superior submarines to the Royal Australian Navy. Naval Group's successful Shortfin Barracuda design, which serves as the basis for the new Attack Class, is a conventionally powered variant of the nuclear powered Barracuda fast attack submarine currently under construction in France for the French Navy. The Attack Class vessels will begin replacing the ageing Collins Class vessels at a time when 50 per cent of the world's submarines will be operating in the Indo-Pacific region.